early August 2000 with 2 majors. You see him getting his second major in this picture under Dr. Margaret Materna. Cello was shown breeder-handled exclusively. The second RED Standard Champion at Farleys D Standard. 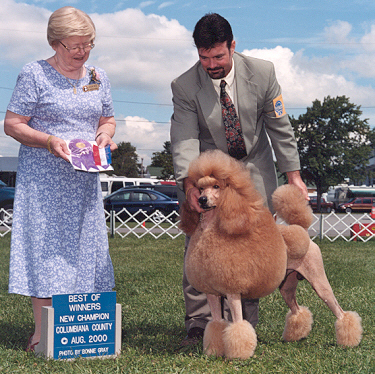 He is the third RED Standard Poodle Champion in the US. He excels in movement, attitude, and personality. Cello lives with owner Maria Steward in Plum Boro, PA. He spends his days between the grooming shop and tending bar in the evenings. For fun he swims in the pool and plays with the horses.